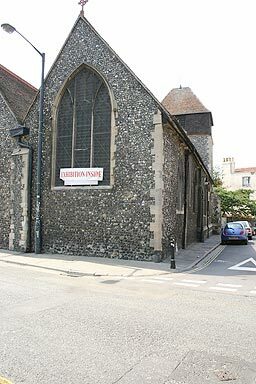 Canterbury Environment Centre now occupies The Church of St. Alphege. The centre is open Wednesday to Saturday from 10.30 to 5pm. It's dedicated to the study of Canterbury, rather than the `environment'. St. Alphege was Archbishop of Canterbury in 1011 when the Danes invaded Kent and sacked Canterbury. St. Alphege was an old man but organised the defence of the city. Alphege was captured and refused to co-operate with the Danes by raising a ransom from his tenants. He was pelted to death with beef bones after a feast. The church started life in the 1070s when Archbishop Lanfranc replanned this part of the city by moving the old roman street to the west. The church was rebuilt at the end of the 12th Century possibly as a result of fire damage. The church was changed again the 13th and 14th centuries. In 1888, the church was restored. The church is notable as the place where Robert Cushman was married. In 1620, he negotiated the hire of the Mayflower to take the Pilgrim Fathers to America. He sailed in the second ship, the Speedwell, and was forced to return to Plymouth. He eventually arrived in America in 1621, he eventually returned to Canterbury in 1625, where he died.